HomeCinemaHollywood GossipJANET JACKSON’S BACK AND SHE’S ALL COVERED UP! 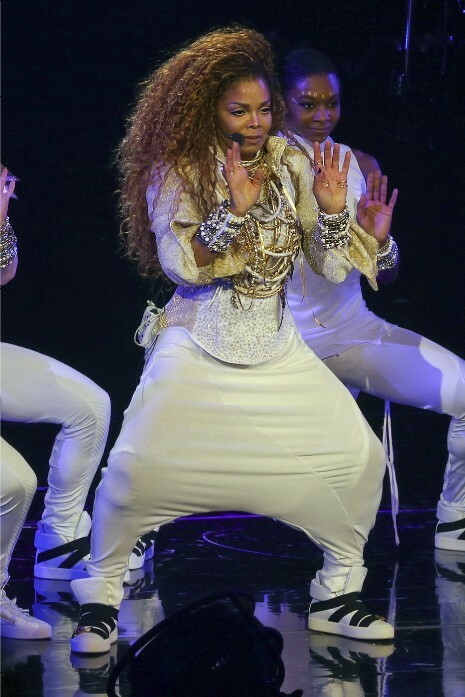 Frankly, we never thought we’d see Janet Jackson onstage again after she married Arab billionaire Wissam Al-Mana. She dropped off the face of the earth for several years – presumably living like an obedient princess in Qatar. A snapshot of her at an airport swathed in black with a black veil (VERY burka-ish) fortified our ominous beliefs. Maybe she finally got bored with all that indulgence. We’re happy to see that Janet’s back onstage (she opened her Unbreakable world tour in Vancouver last night) but she’s not quite the same Janet we knew and loved. She’s no longer “Nasty.” Her Vancouver performance revealed a more demure and less naughty Janet – and her costumes covered her from neck to toe. But we’re glad to have her back. Bigg Boss 9 to have Radhe Maa and Faisal Saif in the show? Mischa Barton: Put Down That Smoothie And Pick Up A Mirror!